We listened to George's speech today on a lashed-up TV in a Brum bar. We weren't able to get into the main Conference hall, because once again party organisers have hugely overbooked for the size of hall they've laid on - you'd almost think they don't value their paying customers. But set that on one side. The really disappointing bit was George's abandonment of fiscal rules. As you will have heard, he's published an economic plan - the Reconstruction Plan for a Strong Economy. Given all the hype, it's surpising no hard copies have been available to ordinary members at the Conference - only to journos - but we eventually read it here. And not only is he rejecting BOM's favourite third fiscal rule -the one that limits the growth of public spending - he's even dropping Gordo's existing rules. 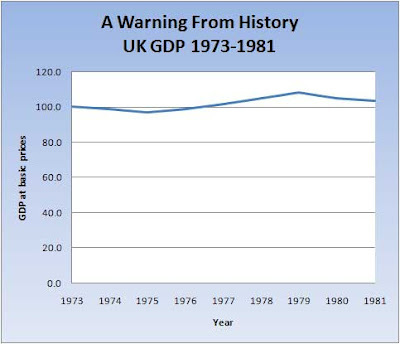 "The failure of the fiscal rules in Britain is consistent with the emerging conclusions of the academic literature on the shortcomings of rules in general. Both on paper and in reality, simple rules have been found to be either too loose to be effective, or so inflexible that governments break them, undermining their credibility. While it might be theoretically possible to design a rule that was right in all situations, it would be so complex that it would be impossible to operate in practice. Instead, economists increasingly argue that institutional change to introduce a greater degree of independent monitoring into fiscal policy is better than any rules based system. This would operate through the introduction of an independent “fiscal council” with responsibility for ensuring sustainable public finances." We don't like the sound of this at all. First, we don't agree that "economists" are saying what George claims. As we've blogged several times (eg here), a recent major study from the OECD recommends "fiscal rules with embedded expenditure targets". Second, putting these matters in the hands of an unelected quango is asking for all the usual problems with unelected quangos - who appoints the quangocrats etc etc (and note this is a much more complex issue than the Bank of England's "simple" task of managing inflation). Third, this framework makes tax cuts even less likely. We are now in a disastrous position on public borrowing and debt, combined with a prolonged period of what's known in polite circles as "sub-par growth" (aka stagnation). As we blogged last week, we now need tax cuts more than ever in order to refire growth. And even if you don't accept the case for unfunded tax cuts (ie the argument that cuts will pay for themselves via their "dynamic" effect on growth), tax cuts certainly boost growth. A Tory government should be straining every sinew to create room for tax cuts by cutting public spending. We believe that a third fiscal rule provides a very public target to guide our politicians into delivering the necessary spending restraint. But George's official monitoring body will not even look at spending - only at borrowing and debt. It will be the same two-legged stool as Gordo cobbled together. It puts absolutely no pressure on George to cut either spending or taxes. The best guess is that we're once again facing 5-10 years of economic stagnation - more like the 70s than the 30s, although given the circs, nobody can rule out far worse outcomes. That's a world in which "sharing the proceeds of growth" is not a sustainable fiscal strategy: quite simply, there is no growth to share. "Mr Osborne will savage as “grossly irresponsible” any attempt by Mr Brown to borrow his way out of trouble. Instead, he will unveil details of a new set of rules, policed by an independent body, aimed at bringing debt down. “It is a forward-looking fiscal policy that is at the forefront of academic thinking anywhere in the world,” said one official with knowledge of Mr Osborne’s plans. campaign, The Times has learnt." Well, rules we like. Independent "policing" bodies we like (with powers of arrest?). Abandoning Labour spending plans we like. But tweaking Gordo's debt rule doesn't answer the big criticism of the existing framework. Which is - as BOM readers will know - the lack of that third fiscal rule directly limiting the growth of public spending (see many previous blogs eg here). And that's a rule that really is at the forefront of academic thinking, including the brainboxes at the OECD. After a decade of rising taxes, simply stabilising the existing fiscal position is not enough. We need a clear strategy for cutting taxes in a world of economic stagnation. That in turn means a programme to cut public spending as a percentage of GDP. Just like in the 70s/80s, public spending must be hacked back to make room for wealth creation. It's painful, but it has to be done. Now, is George going to do the biz? As Mr and Mrs Tyler pack for their autumn minibreak in Birmingham, the BBC has swiped Alan Duncan for suggesting the Tories will inherit a fiscal wasteland from Gordo & Co. Apparently, that's triumphalist and taking the electorate for granted. Dontcha just love the BBC? Especially since Duncan is quite right about the fiscal outlook: with only months to live, Labour are going to incinerate the public finances. That fairweather 40% debt "ceiling" has already been blown by the Crock debt, and as the recession bites, borrowing will soar. Looking forward, the recession... more bank bailouts... emergency tax cuts... by 2010-11 Tyler reckons the debt percentage could easily be pushing 50%. It's a fiscal disaster. George will inherit nothing more than a smoking patch of bare blackened earth. Oh... but then... umm... wonder what happens to sharing the proceeds of growth? Let's hope he's got some ideas. PS Depending on operating conditions, posting from the Tory Conference may be sporadic. British taxpayers are in serious jeopardy of a once-in-one-thousand-year stuffing. The Simple Shopper - the same Shopper who can't even be trusted to buy Post-It notes - is now lining himself up to buy a pile of incomprehensible toxic debt from a bunch of fast-talking bankers. Look, nobody would start from here, but taxpayers should not be forced to bail-out bankers. Simple as. And as we've argued already, in situations where we have to step in to protect depositors and head off systemic collapse, we should demand a big equity stake in the company. Existing shareholders must be diluted right down (see this blog and this). "Sweden did not just bail out its financial institutions by having the government take over the bad debts. It extracted pounds of flesh from bank shareholders before writing checks. Banks had to write down losses and issue warrants to the government. That strategy held banks responsible and turned the government into an owner. When distressed assets were sold, the profits flowed to taxpayers, and the government was able to recoup more money later by selling its shares in the companies as well. And this is effectively what Paulson has already done with his rescues of Fannie, Freddie, and AIG: existing shareholders have been subordinated to taxpayers in terms of future returns from the rescued companies. Note too the insistence that bad debts are written down to their true estimated value before any rescue is agreed. The fear that banks are not fessin' up to the true scale of their likely losses is one of the most toxic elements in the current situation - it has destroyed trust between the banks themselves. The Swedish bank rescue is widely viewed as one of the most successful ever, and it's contrasted with the failed approach of the Japanese authorities in roughly similar circumstances at about the same time. The Japanese failed to grip the issue of bad debts. They allowed their banks to limp along without being forced to recognise reality, and the country was hobbled for more than a decade with a bunch of what became known as Zombie Banks. With a broken financial sytem, the Japanese economy suffered a decade of extremely low growth (under 1% pa). Whereas the Swedish economy was back on its feet in three years, and grew by 3% pa over the subsequent decade. The fact is nobody knows what this toxic debt is worth. There is no proper market in it, and nobody even knows how much there is: figures of $1 - 2 trillion get tossed around, but nobody knows*. In these circumstances, sending the Simple Shopper down to the market with our wallet, our chequebook, and the deeds to our house, is terminally bonkers. Let's say to the bankers, yes we'll take your debt, but this time we want the deeds to your house as well. You can go on living it it, but on our terms, and on the understanding that you help clear up the mess you've made. And when we finally come to sell up, we have first dibs on the proceeds. Or would you bankers rather go and work down Walworth Market? "What exactly does Ruth Kelly think she's doing making her own childcare choices? Surely she's not saying that it is appropriate for parents to decide how best to look after their children. If that's the case, why is the government taxing everybody to pay for its own preferred solution of parents working and putting the children (sorry,"kids") into institutionalised care? If the government thought that parents were capable of making their own choices, they would have just given them a tax break or direct subsidy (or whatever) so that they could choose for themselves how best to provide care for children. But they didn't, because parents don't know best. Doesn't Ruth Kelly realise this?" We take his point. Not only has Ms Kelly been a member of the cabinet for four years, but for half that time she was Education Secretary, directly in charge of state childcare. She can hardly claim not to understand government childcare policy, the entire thrust of which has been 'wrap around' childcare, including extensive pre and after-school provision. Why, only yesterday, her successor Blinky Balls was banging on yet again about their massive expansion of nursery school places for two year-olds (eg see here). What is wrong with Ms Kelly? BOM believes she is a danger to society. She should be arrested and despatched to a state parenting skills re-education facility soonest. We're currently spending £43bn pa on state childcare (aka state schools), and a further £2.3bn on "Children and families" (Sure Start etc). It is all directed by the Commissariat, with parents having no meaningful say whatsoever. Not unless they have money, that is. Ruth Kelly herself - like many Labour hypocrites down the years - is quite happy to buy private education for her own children. Last night Tyler gave up on the hysteria of Webb and Peston, and instead surfed the US News channels. He wanted to find out what's really going on with Paulson's $700bn TARP (Troubled Asset Relief Program). But what he actually saw was enough political grandstanding to bring on one of his dizzy spells. 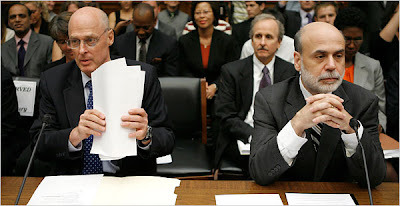 To start with, members of the Congressional Committee grilling Paulson and Bernanke on live TV were concerned mainly with mouthing off for their constituents back home - long written statements followed by the weakest kind of underarm deliveries imaginable. They made our own PAC look like a lion's den in comparison. Then one of the Washington TV pundits explained that the actual deal had already been done with Congressional leaders behind closed doors in one of those smokeless rooms. The Committee hearing was simply so Representatives could cover their own backsides with voters: "we had to pass it because the Administration told us the world would collapse if we didn't - you heard them!" Suddenly Mr Ovenchips popped up in front of two US flags to announce he was putting his faltering campaign on hold so he could personally supervise events back in Washington. He looked very old and rather desperate. Shortly afterwards that nice Mr Obama appeared in front of another two US flags to say he was not putting his campaign on hold, and that Ovenchips shouldn't have rushed out to grandstand for TV. Even though he himself seemed to be doing precisely the same thing. The pundits on Bloomberg talked more sense. They said nobody has a clue how the Paulson plan will work in practice - even Mr P doesn't know that. But something has to be done, and this is it. Oh, and taxpayers will likely get stuffed. Which is a shame, but what can you do? Tyler could only thank God he's not a US taxpayer. The bankers have apparently panicked and blagged their way into a $700bn get-out-of-jail-free card. OK, they're not quite getting out free - bank shareholders have already taken one helluva whack, and banks will face much heavier regulation from here on. But being able to offload their toxic debt assets onto taxpayers is one huge weight lifted from their shoulders. The key question now is price: at what price will the TARP buy these assets? We've recommended the debate taking place on the FT Economists' Forum already, and there's a good summary of the pricing issue here. In the absence of a real market price from a functioning market, there are a wide range of possible pricing bases. They run from full nominal value - ie 100 cents to the dollar - to fire sale prices, which are maybe 20-25c to the dollar. Clearly from a taxpayers' perspective it would be best to go for the fire sale - at that level, taxpayers might reasonably expect to get all their money back eventually. But the problem is that the banks can't afford to sell at that price - quite simply, it would wipe out all or most of their equity, and they'd have to shut up shop. So the actual price is likely to be driven not by what this stuff's actually worth, but by what price the banks need so they can stay in business. Which means taxpayers will almost certainly overpay for the assets, while bank shareholders are left with the full equity stake in their now detoxified bank: a pure gift from taxpayers to bank shareholders. WTF should taxpayers accept that? A much more appealing idea (as we blogged here) would be for taxpayers to take a big slice in the equity of the banks. They'd still have to stump up the $700bn - or whatever it finally turns out to be - but they'd now have a share in the eventual upside from keeping the banks in business. Which means that existing shareholders would take less (ie they would be diluted): a much fairer arrangement. Now, given the current crisis, it's probably too late for US taxpayers to insist on that. But it isn't too late for us. What precisely is our government planning to do when another of our banks comes begging? Given the Crock fiasco, do they now have a plan? How will they ensure that any further bailouts are are accompanied by bank shareholders being "crammed down" (which of course did eventually happen with the Crock, but only at the cost of full nationalisation). What's the deal? It's time we heard so we can start debating it now, not in the midst of the next crisis. "No paternity leave, no New Deal, no bank of England independence, no Sure Start, no devolution, no civil partnerships, no minimum wage, no new investment in the NHS, no new nurses, no new police, no new schools." Paternity leave and the minimum wage - these are part of Labour's mega-package of labour market regulation, which has imposed such heavy additional costs on British employers. Even during the good times they have had a seriously damaging effect on employment in depressed low productivity areas like Dewsbury (see this blog), and in low-wage occupations like agriculture, cleaning, catering where "protected" domestic workers have been displaced by hundreds of thousands of unprotected black market immigrants. The problems are about to get much worse in the economic downturn. New Deal - As the Public Accounts Committee discovered last year, the government's welfare-to-work programme, the New Deal, has been a hugely expensive fiasco (eg see this blog). Despite costing us some £6bn, we still have 4.2m people of working age living in workless households, the vast majority of whom are supported by taxpayers, costing us an estimated £12.7bn pa, including £3.4bn pa on benefits for lone parents (source: NAO Report). That's equivalent to nearly 4 pence on the standard rate of income tax. And most of the individual New Deal programmes cost taxpayers far more than simply continuing to pay the benefits - one especially daft programme costs an eye-watering £76,540 per job. Bank of England independence - as we've blogged many times, BoE independence in terms of monetary policy is A Good Thing, and the Tories should have done it when we crashed out of the ERM. But the way that Labour - and more specifically, Gordo himself - actually implemented independence, has been a disaster. For reasons known only to themseleves, they packaged independence with stripping the Bank of prime responsibility for bank oversight, and transferred it to the half-baked low-skill FSA. Post the Crock, the new arrangements have been slammed by everyone, including the Labour dominated Treasury Select Committee (eg see this blog). They will cost us billions. Sure Start - frankly it's baffling that Gordo still mentions this £5bn+ fiasco, when everyone including Blair admits it has totally failed. It has not helped the bottom-of-the-heap kids it was designed for, but has mainly gone to better-off families who didn't need the help (eg see this blog). Presumably there are now so many public sector jobs dependent on it, Labour will just keep it going. Devolution - this is another crippling fiasco. As we've noted many times (see here for all Scotland blogs), by devolving spending authority without devolving tax-raising responsibility, Labour has given us the worst of all worlds. English taxpayers are increasingly resentful of Scotland's higher public spending allocations, and the Union is under threat as never before. Civil partnerships - hurrah! One item on Gordo's list that he actually can boast about. But let's not get carried away - after a flurry during their first year, the number of civil partnerships halved last year to just 8,728. Investment in the NHS - first, let's revert to calling it spending on the NHS, shall we. And yes, Labour has massively increased spending - it's almost tripled since 1997-98, a 70%+ increase in real terms. But the results have been dismal. We still lag Europe on most measures of health outcomes (like cancer survivorship), and according to the Office for National Statistics, NHS productivity has been falling by 2-2.5% pa (see this blog). Nurses - yes nurse numbers have increased - from 320,000 in 1997 to just under 400,000 now. But there are increasing doubts about the way nurses are used, from "too posh to wash", through to the amount of admin work now landed on them, through to the nurse quacktitioners supplanting doctors. Moreover, during the giant recruitment splurge earlier this decade, many overseas nurses were employed, some of whom lack the necessary language skills, and who subsequently blocked the recruitment of newly and expensively trained British nurses. And because of vast over-recruitment, nurse numbers have actually fallen since 2005. In reality, it's another expensive shambles (see many previous posts, eg here). Police - yes again, numbers have increased - from 127,000 in 1997 to 140,500 now. But when the Home Affairs Select Committee probed this last year, they pointed out that police numbers had increased far less than police budgets - only one-quarter as much - and they reported a depressing catalogue of inefficiency and mind-boggling paper mountains. Police on the beat, it ain't. New Schools - yes, Labour has spent a packet of our money on new school buildings - many funded via over-priced PFI contracts. Moreover, they are planning to spend a further £50-70bn over the next decade in a crazed binge to rebuild 3,500 secondaries and half our primary schools (see this blog). But of course, what matters is not the school buildings, but what happens in them, and on that we have endured another decade of dumbing down and social engineering. Among other things, A Levels are now two whole grades easier (see this blog), and we have crashed down the OECD league table of educational achievement (see see this blog). Look, Labour governments always spend vast amounts of our money. That's what they do. We all know that. We also know they always confuse spending with results. But rarely have we had such a clear illustration of how they see success in a record of unmitigated failure. As we look forward to A Completely New World of massive public spending, high taxation, and soaring debt, this is no time for a novice. We can feel proud of everything we've achieved. If we'd listened to the Tories we'd never have had a £250bn increase in annual taxation; we'd never have had a £65bn increase in annual public sector borrowing; and we'd never have had an additional £300bn of national debt (let alone the £1.3 trillion of secret debt we've squirreled away in the public accounts). My only ambition is to serve this Great Nation of ours. And to ensure that our children can look back on the decisions we made and say ****!!!! PS For the full grisly facts, see the TPA's Gordo scorecard. Now it's turned out greed maybe ain't quite so good after all, nobody is going to defend the boys and girls who've been rinsing it at the trough. And nobody can be surprised that grandstanding politicos of every complexion have been queuing up to demand Action. An incomes policy for bankers? A ban on bonuses? A cap? The central casting trade union leaders speaking in Manchester are demanding it, but government ministers have taken fright. They presumably realise that with financial services accounting for nearly 10% of GDP, the City directly employing 350,000, and their post-election jobs to think of, bashing bankers right now might not be the greatest idea. And incomes policies for bankers are most unlikely to work: bankers are far too smart/greedy to get boxed in by the kind of lumbering one-size-fits-all restrictions beloved of Whitehall. As Tyler may have said before, back in the early 80s he joined a City merchant bank. Maggie had abolished Labour's incomes policy, but its marks were still visible. The bankers were all wedged with non-cash benefits specifically designed to get round the restrictions of incomes policy - company cars, heavily subsidised mortgages, enhanced employer pension contributions, some even had their kids' private school fees paid by the bank. And when it comes to bonuses, the possibilities are endless: the Major's brainy friend Herr Docktor Professor Franz Kuntz has already dusted off his Super-Enhanced Kruegerrand Roll-up Fund (Cayman) for distribution to needy bankers. No wonder the government has handed the problem to the FSA. Somehow, they will find a way of regulating bank bonuses without having an incomes policy per se. How? New FSA Chairman Adair Turner tried to explain last night. His idea is that the FSA will review a bank's remuneration policies as part of its risk monitoring activities; if they decide employees are being incentivised to do too many risky deals, they'll impose tougher capital requirements on the bank, so there will be a cost. Er... yeeeesss. It's one of those classic ideas that sounds OK in a vague arm waving kind of way, but hasn't a prayer of getting past the detail devil. Especially when you remember that this is the same FSA that was "asleep at the wheel" as the Crock kereered towards the cliff edge (see previous blogs for just how rubbish the FSA actually was - eg here). Everyone now agrees that bank regulation must be tightened asap. But the need is to protect us against systemic calamity by further restricting the riskiness of the banks' balance sheets. Bashing bankers might be fun, but it's a dangerous distraction. *Footnote - don't Wall Street's 1987 salary numbers now sound quaintly small - $200K pa for a top US executive? In recent times, a junior Wharf trader wouldn't wipe his bottom on $200K. Debt - governments are taking on a stack of debt from floundering banks; in the US the transfer is adding hundreds of billions to taxpayer debt; here in the UK we've already got the Crock's £100bn, plus whatever implicit guarantees Brown may have given Lloyds on their takeover of HBOS; there's undoubtedly more to come; and always remember - government debt is nothing more than deferred taxation. Borrowing - as our economies fall into recession (now inevitable), fiscal deficits will soar; serious forecasters are already suggesting the UK deficit could easily reach £100bn pa; if we returned to levels of borrowing seen in the early 90s recession - quite conceivable - borrowing will increase to around £120bn pa ; just for reference, the government's 2010-11 borrowing forecast currently stands at a ludicrously optimistic £32bn. Inflation - we're already up to nearly 5% and the lesson of history is that heavily indebted governments default via a good dose of inflation - savers pay; of course, as things stand, the Bank of England is meant to save us from that, and somehow get inflation back down to 2%; but with the financial markets in turmoil and a recession looming, the heat is on them to be "more flexible"; they could rationalise it on the basis of anticipating a fall in future inflation... as indeed, many commentators are already proposing. Head for the hills is one option. But we suspect the hills aren't big enough to accomodate us all, so we need to find some alternatives. And despite last week's panic, the least unattractive options still involve making the banks and their shareholders sort out the mess themselves. 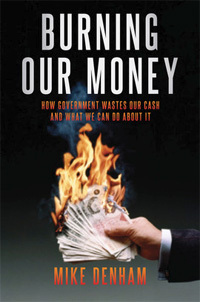 They did the lending, they reaped the profits, and they failed to manage the risks properly. Why should taxpayers be forced to bail them out? The answer of course - as Hank Paulson spelled out to US legislators on Friday - is that we don't want innocent bank depositors to be wiped out, and we don't want the financial system to seize up. But if it transpires that the only way of achieving that is to bail out greedy bankers when they run out of cash, then we've lost. We might as well nationalise deposit takers, and much else besides (see this blog). Unless we come up with some more market-based solutions pdq, the left are going to walk away with this (as you can hear quite clearly from the likes of Neal Lawson and Yvette Cooper at the Labour Conference). What we need to do is to find a way of leaving the cost and the headache with the bankers themselves. Leave them with the problem of how to work-out their dodgy debts over the long-haul. Not only is that fairer on taxpayers, but also the bankers know far more about the issues - eg "where the bodies are buried" - than any government administrator can hope to know. A government bulk take-over of so-called toxic debt is fraught with danger for taxpayers. First, at what price do we take the debt? Not full face value, for sure. But if not there, then where? Who sets the price? Bearing in mind of course, that one major cause of the current crisis is the feeling that many banks have not written down their debt investments nearly enough yet, for the simple and scary reason they don't have enough capital to recognise the full loss. If we cram them down too much, they'll have to shut up shop. And also what happens down the line? Taxpayers don't want to be funding the debt for ever, and it would likely get resold once the current panic has subsided. But again at what price? We could well end up with the debt being resold back to the very same bankers at a knock-down price, from which they could then make a further profit. Is that what you want? There are some interesting alternatives being kicked around by a range of eminent economists on Martin Wolf's FT blog. One emerging theme is that instead of nationalising the toxic debt outright, we taxpayers should offer the struggling banks an equity injection. We should recapitalise them to give them a breathing space. In that way we'd leave them with the problem and cost of working out their toxic debts over time. But wouldn't that just be pouring petrol on the flames? Wouldn't it mean we'd never see our money back? On the second point, it might well do: if the problem debt actually has no value, we're stuffed. But then, we're no worse off than we would be if we simply nationalised the debt, as is currently proposed. And on the first point, our equity injection would carry some stiff conditions for the banks. To start with, it would not be straight equity, but a form of equity loan known as preferred stock. It would eventually have to be repaid, once the current difficulties had passed. Second, any bank joining the scheme would have to agree a realistic write-down of its problem debt: we'd insist on full disclosure so as to remove the fear that banks are not fessin' up to the full extent of their problems. Third, our equity would rank ahead of existing shareholders, and a participating bank would be banned from paying any dividends to those shareholders until we had been fully repaid. Fourth, we could insist that a joining bank should raise matching equity funds from its existing shareholders. They couldn't rely solely on taxpayers. And all those bank bonuses that people are so exercised about? Should we ban them? No. Government incomes policies have always been a disaster, and it would be in our interests to retain the talent in our banks. But we'd be shareholder activists, and we'd encourage existing shareholders to get much more involved in designing longer-term incentive schemes that rewarded the realisation of value rather than the assumption of risk. There's a lot to think about here, and thinking in a crisis is always tough. But even after last week's drama, taxpayers should not simply get bounced into nationalising the bad debts of the banking sector. There are still alternatives. During a most enjoyable dinner last evening, Tyler found himself sandwiched between two market experts. 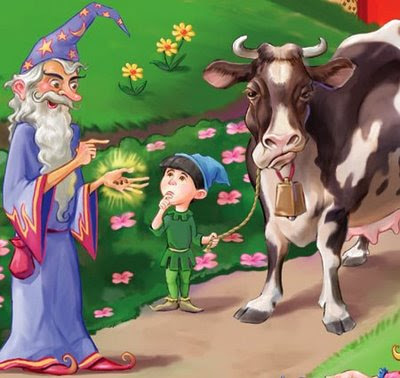 On his right was an expert in financial markets. Well, a hedge fund manager anyway. And on his left was an expert in art markets - to wit, a professional artist. Naturally, the discussion turned to markets. Just why did the financial markets blow up? The hedge fund manager groaned. "Confidence shot - can't trust anyone - haven't a clue what anything's worth - can't price risk - cash is king - 1930s - God, is there anything left in that bottle?" Well, maybe it's time to switch into sharks in formaldehyde, suggested Tyler brightly. True, nobody has a clue what they're worth either, but Damien Hirst's Sothebys sale seems to have gone spectacularly well. "Yes, doesn't it," replied the artist. "Yes, £111m... most successful single artist sale ever! Yes, yes... amazing... absolutely amazing... althoooough..."
"Well... it's just that there's a whisper going round that the sale wasn't all it seemed. Some of the major bidders seem to have been people associated with Damien himself... apparently more than half the opening day's successful bids came from his own dealers." The hedge fund manager looked appalled: "What? What!! You mean he rigged the auction? I'll tell you what! If he did that in the financial markets, he'd go to jail! And they say we're the sharks! God! Is there anything left in that other bottle?" Tyler frowned. 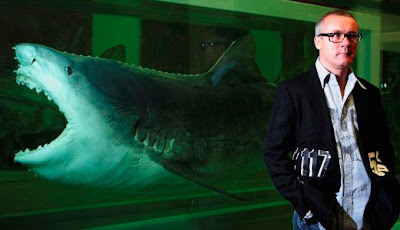 But surely Hirst's associate bidders would have been seriously out of pocket? Wouldn't they have had to pay the auctioneers' commission? 12%? "Yessss... well... there are all sorts of rumours about Sothebys cutting him a pretty keen deal. I mean Joan Collins went to the auction FFS! It was a media celeb fest - look at all the free publicity they got from the BBC etc. Nobody thinks the commission rates were anything like 12%." Our hedge fund dining companion looked a tad glazed. "Assshllly. Acccssshllyyy! I've just had a brilliant idea!! If Morgan Shchtanley auctioned all its dodgy debt to Goldmans, and Goldmans auctioned all its dodgy debt to Morgan Shchtanley... hey preshto, problem solved! Everyone can shee theresh a proper market prish! A proper prish! Thish ish brilliant... why hasn't anyone... "
Unfortunately, at that point he sank below table level, so Tyler was unable to hear the rest of what seemed to be an inspired market recovery plan. PS Our man at the Wharf has spent the week chained to his desk, and sadly seems to have contracted another bout of Nile Shorting Fever gravissimus. But during a brief moment of lucidity earlier today, he urged us to switch the entire family fortune into UltraShort Financials ProShares. Shorting financial stocks is now illegal, but this is a highly leveraged fund that seeks to generate twice the inverse daily performance of the Dow Jones U.S. Financials Index. You know it makes sense. Most European countries force consumers to subsidize electricity from wind power. This makes "renewables" a very safe investment compared with other energy businesses, where swings in commodity prices can be large. As Europe's big integrated oil and gas companies—such as Shell, BP and Total—invest more and more in Liquid Natural Gas, they are also lobbying hard for a world-wide carbon-emissions trading system that would further increase the advantage of gas over coal. In the U.S. the same thing is happening. The problem for the natural gas industry in the U.S. is that gas is still relatively inexpensive compared with market prices elsewhere in the world. There are no facilities for LNG export. This may explain why Shell, BP, Chevron and T. Boone Pickens are investing in wind power. It's a clever strategy to add value to their gas assets by boosting demand. These gas players can afford to lose money on wind power in the short term to reap huge profits in the long term. In fact, this was the strategy first implemented by Ken Lay of Enron in 1990s. Enron was the power and gas company that started the first large-scale manufacturing of wind power in the U.S. It also brought up the ideas for a cap-and-trade system, to increase the competitive edge of gas over coal." Good to know that an extremely ill-wind for taxpaying consumers is blowing a lot of good in someone's direction. 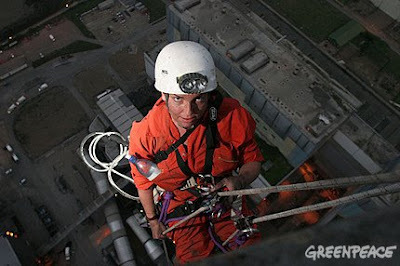 Well done Greenpeace. One of the largest over-allocation of permits is to Castle Cement, which makes a quarter of all British cement at three works in Lancashire, north Wales and Rutland. The figures show carbon dioxide emissions from the three plants have fallen from 2.3m tonnes in 2005 to 2.1m tonnes in 2007. Yet, under the ETS, the firm has been handed enough permits to produce 2.9m tonnes CO2 for each of the next five years - an annual surplus of 829,000 permits... worth £83.5m over the five years." Of course, there is a simple solution to this increasingly costly nonsense - stop listening to hippies, and instead start jailing them when they commit clear acts of criminal damage. Still, at least the government does read BOM. It is following the advice we offered here and is abolishing the entirely useless £15m pa EnergyWatch. Hurrah! [Yes, OK, as per, they're not really abolishing it, just wrapping into another quango... but they are apparently promising to sack 90% of the quangocrats]. NHS Direct? That useless phone service that tells you to see a doctor? Surely, it's been canned, hasn't it? Er, no. In fact, taxpayers have just shelled out an undisclosed amount to design its brand new corporate logo - a blue balloon. Postman Patel has the jaw-clenching details (HTP Zizania). "...car manufacturers will no longer be forced to provide parts and computer codes to independent garages so they can carry out repairs on the vehicles. Instead motorists will have to have their cars fixed at the manufacturer's dealership workshops, where charges are up to 40 per cent more. The average hourly charge at an independent garage is £55.63 compared to £94.70 at a dealership garage, according to recent figures." As we've blogged many times, the cost of government is so much more than just tax and spend. When last sighted EU regulations were estimated to be costing Britain £120bn pa, or £2 grand a year each. "Council staff on the lookout for paedophiles have been ordered to stop and quiz any adults found walking in Telford Town Park without a child. Anyone who wants to go to the park but is not accompanied by at least one youngster will have to explain why they are there. The policy came to light after two environmental campaigners dressed as penguins were thrown out of the park last month when caught handing out leaflets on climate change. Telford & Wrekin Council said Rachel Whittaker and Neil Donaldson of the Wrekin Stop War pressure group were ejected because they had not undergone Criminal Records Bureau checks or risk assessments before entering the park" (and watch the vid here). Yes, it's another OTT nanny/police state commonsense over-ride. Yet according to the Audit Commission, four-star Telford & Wrekin Council is one of our very best - which tells us something about the way the AC rates councils. And as Mr Brillo asks, what does this outrage cost local Council Tax payers? (As it happens, Tyler himself has suffered park pervert suspicion. While waiting for his car to be MOT'd last year, he sat down on a nearby park bench to munch a sandwich. Within a couple of minutes he noticed two mothers were eyeing him in a very hostile manner from the childrens' playground area. With a horrible jolt, he suddenly realised they thought he was a perv. He swiftly moved on, feeling a mixture of embarrassment and anger, and wondering WTF we can't just put everyone's mind at rest by locking away the actual offenders for life (because as everyone now understands, it's an incurable condition). As you’ll have gathered, Tyler is up to his nethers in the Slough of Despond. True, his investments now seem to have regained a crumb of value, but the week has been a disaster for the cause of small government. The markets have blown up. The Masters of the Universe have been revealed as not just greedy, but also highly dangerous - wild beasts who must be hunted down and dealt with. Theoretically, markets take care of it themselves - they have their behavioural quirks, but the so-called "fundamentals" are eventually supposed to win out over reckless speculation before it gets out of hand. Only that hasn't happened. Instead, big strong government has had to come to the rescue. And now, just like the thirties, the message is up in lights: only big strong government stands between us and the abyss. The thing is, even those of us who believe in markets can see that something has gone seriously wrong. At the start of the week we thought the reeling markets would pull themselves together. After all, Lehman had been on the critical list for a while, and with its shareholders wiped out, its carcass would quickly get gobbled up by better capitalised banks. And once the central banks had pumped in some more Bagehotian liquidity, everything would settle back down again. Nice idea. The trouble is, the markets were incapable of following the script. And so we've had a week in which the US government was forced not only to take over their biggest insurer, but to promise the nationalisation of all their banks' problem debts. And that's on top of nationalising the major mortgage providers. Even Roosevelt would have blenched at such a precipitate lurch to socialism. And the cost? Nobody knows what the final bill for taxpayers will be, but the numbers being tossed around are scaled in trillions (ie thousands of thousands of millions). That argument... can now be extended to include the new, transactions-oriented, capital-markets-based forms of financial capitalism. The risk of a sudden vanishing of both market liquidity for systemically important classes of financial assets and funding liquidity for systemically important firms may well be too serious to allow private enterprises to play. No doubt the socialisation of most financial intermediation would be costly as regards dynamism and innovation, but if the risk of instability is too great and the cost of instability too high, then that may be a cost worth paying." And if you took a poll right now, that's what virtually everyone would say. Especially once taxpayers cotton on to how much these bailouts are going to cost over the long-term. And what does it matter that financial deregulation has made it ten times easier to own your own home if a financial collapse triggers a depression and you can't afford the repayments? "Here at PIMCO, there is widespread support... as to the existence of an equity bubble. Almost to a person, we believe that Mr. Greenspan should quit giving away puts on the equity market. At the same time, we also recognize that we must configure your portfolios not for a world that we think should exist, but for the one that does exists. For example, while I may think the case for a Fed hike in margin requirements on stocks is compellingly clear, it is also clear... it simply isn’t going to happen." Of course, the PIMCO statement coincided almost exactly with the top of the equity bubble, and it was downhill from there. And what did Greenspan do? Yup, he cut interest rates. "Mr Greenspan bears responsibility is his role in ensuring that the era of cheap interest rates created a speculative bubble. He cannot claim he was not warned of the risks. Take two incidents from the 1990s. The first came before he made his 1996 speech referring to “irrational exuberance”. In a Federal Open Market Committee meeting, he conceded there was an equity bubble but declined to do anything about it. He admitted that proposals for tightening the margin requirement, which people need to hold against equity positions, would be effective: “I guarantee that if you want to get rid of the bubble, whatever it is, that will do it.” It seems odd that since then, in defending the Fed’s inaction, he has claimed in three speeches that tightening margins would not have worked. The second incident stems from spring 1998 when the head of the Commodity Futures Trading Commission expressed concern about the massive increase in over-the-counter derivatives. These have been at the heart of the counter-party risk in the crisis. Mr Greenspan suggested new regulation risked disrupting the capital markets." And later, as the US property market inflated its own gigantic bubble, Greenspan dismissed it as a little local "froth". There seems little doubt that Greenspan was far too complacent about the risk of asset bubbles. And that isn't hindsight, as the PIMCO quote from 2000 underlines. But I dunno. Was he really such a bad guy? Coming out of the roller-coaster 70s and 80s, his principal job was to keep the economy on an even keel. And in that, on most traditional tests, he succeeded spectacularly - only one year of negative growth, and only one year with inflation over 5%. Your average punter quite understandably sees him and his fine tuning Fed as a success. Of course we sophisticates can see he made a serious mistake. But actually, the mistake was to have too much confidence in the ability of financial markets to correct themselves. The very same mistake that Tyler made earlier this week. I'm afraid to say, we're facing much more regulation. And much less willingness to trust markets. The accompanying report is also well worth reading. From the economy, to tax, to debt, to pensions, to public services, to welfare, it sets out in horrific detail the full extent of Gordo's dire record. Much will be familiar to BOM readers, but to see it all brought together on a 45 page charge sheet is enough to make you become a short seller. By now we all know about the huge weight of debt dragging down the financial markets. But frankly, Tyler's too depressed to think about that any more. So to lighten things up, let's take a look at today's latest government borrowing stats. "... if the rate of the slide persists, borrowing for the full year would be £65bn, compared to £43bn forecast by Chancellor of the Exchequer Alistair Darling in his March budget." Translation: things are going to get a whole lot worse from here, so full-year borrowing could easily be £75bn, or 5% of GDP. What's more, this month's ONS figures for the first time include our Crock debt, which at end-August amounted to £87bn. Which means that Gordo's 40% official debt ceiling has already been exceeded by 3.3%. Hope you enjoyed the fat years. OK, there's no denying it. This has turned into a terrible week. Not only is it a terrible week for bankers and their shareholders, it's a terrible week for those of us who believe in small government. The US government has nationalised its biggest private sector insurer, its legislators are drawing up tough new financial market regulations, and the supporters of Big Government -including most of the British broadcast media - are in full cry. John Snow wants to see the evil men of greed brought to heel, Will Hutton wants hard man Mervyn King sacked and commercial bank liabilities nationalised, Paul Mason wants an FDR style ban on investment banks, etc etc. As a very subdued Irwin Stelzer said on Newsnight, we have to accept the urgent need for changes in financial market regulation. Tougher capitalisation ratios for sure, greater oversight of liquidity management, and in this country, that long delayed Darling package on special bank resolution and better depositor protection. But we also need to take a cue from George - yes that George. Last night he resolutely refused to blame the markets. Accepting that it wasn't edifying to watch short sellers making money out of misery (cf Black Wednesday), he pointed out that the real root of today's problem was the huge debt bubble that built up over the last decade or so. That was what fueled the property boom, and the excesses in the financial markets. At the end of the day the world's central bankers have to take a big slice of the blame. They provided the cheap money which underpinned the growth of debt. In particular, the famous "Greenspan put", which saw 20 years of the US Federal Reserve moving to cut interest rates aggressively every time financial market turmoil seemed to threaten the long economic boom. The 1987 stock market crash, the Mexican crisis, the Asian crisis, the LTCM debacle, and the bursting internet bubble - after each, US rates were slashed. For long periods, US short-term interest rates were actually lower than the inflation rate (ie real interest rates were negative). It was cheap cheap money. Now we face the consequences. As we've been blogging all week, we think much of of the commentary on this crisis is hysteria - this is not the end of the world. But it's certainly confirmed that we now we face a recession, followed by a prolonged period of jobless joyless 1970s style recovery. It may not be quite as bad as the last two decades in Japan, but we're going to have a pretty grim time. Events this week have surely sealed a Tory landslide. So let's hope George remembers the lessons of the past: the only sustainable way back to economic health is to downsize government and trust the markets. But there's no denying that the last week has made that a much tougher sell. As we all know, financial markets are driven by fear and greed. We've had the greed, and now we've got the the fear. As we all also know, the lesson of history is to stay calm. No, straight up - that is the lesson. So what does staying calm mean for taxpayers? Most important, it means not going along with media hysteria that the financial system is in meltdown. It isn't. Yes, there's far too much debt - much of it stuffed into those opaque packages we read so much about - which must be reduced. And yes, bank profits and bank shares have taken a serious whack, and there may be more to come. 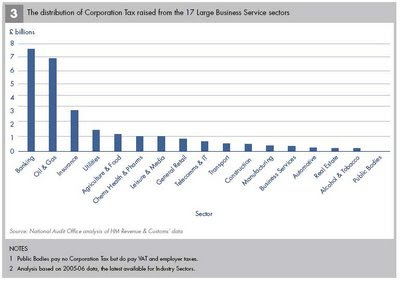 And yes, financial sector jobs are under the axe. But none of that means we're doomed. It's a necessary adjustment to the excesses of the last few years, and must be allowed to work through. And the horrible truth is that such adjustments never happen in a calm orderly manner. So why do taxpayers have to get involved at all? We don't want to bail out a bunch of greedy bastards, so why not just stand back, rub our hands in glee, and let nature take its course? Well, back in the early 1930s exactly that approach was tried. Following the 1929 Wall Street Crash, the US hit a banking crisis as the debt-driven excesses of the 1920s were worked out. The US authorities initially decided to leave things to nature, and there was a wave of bank closures. But the catastrophic result was a serious contraction in the US money supply and yes, the Great Depression. As the great Milt later wrote, “the Great Depression was produced by government mismanagement” (see also Milton Friedman and Anna J. Schwartz, A Monetary History of the United States, 1867-1960 ). So tempting though it is, we can't simply stand back and leave things to nature. We have to stop depositors being wiped out. And the somewhat reassuring news is that these days, governments and central banks on both sides of the Atlantic understand that. But as we've consistently argued, while we must protect depositors, we should not protect shareholders. We need to ensure they take the pain so they can remember how it feels. Because going forward, shareholders are key to ensuring bank managements give much greater weight to fear as against greed. All we know for sure is that we've taken on the Crock's £100bn of mortgages, some of which are clearly dubious. More worrying is that we may be guaranteeing the dodgy end of HBOS's assets in order to sweeten the Lloyds takeover. But given the fair trading waiver they've already extracted, let's hope that hasn't been necessary. So compared to US taxpayers, we seem to have escaped quite lightly. And that takes no account of personal tax payments on all those City bonuses. It's going to leave quite a hole. In truth, nobody really knows whether the slump in HBOS's share price is simply caused by an unwarranted speculative attack by Kaletsky's short sellers, or whether it's more serious. What we do know is that HBOS has big exposure to the housing market and they've been aggressive lenders in the buy-to-let market. Plus, they've developed a reliance on the very wholesale funding that triggered the Crock collapse. First, the government has to act. This share slide is becoming self-fulfilling. Frightened depositors (Mr and Mrs T among them) are probably already forming Crock-style pavement queues. We need a clear statement that depositors will be protected, just as they already are with the Crock. Second, the government must make absolutely sure that any taxpayer support is put in above shareholders. Hank has shown the way. According to BBC R5 Live, Lloyds have galloped to the rescue... they are to take over HBOS... hurrah! Hank is such a great apples and pears rhyming name. Much better than Alistair. And come to think of it, Hank is also better than Alistair in a couple of other respects as well. Like protecting taxpayers' interests in the face of financial crisis. Whereas Alistair faffed around for 6 months over the Crock and finally had to resort to a full-blown taxpayer take-over, Hank moved swiftly to fold Bear Stearns into JP Morgan. OK, in the process he did land taxpayers with $30bn of dodgy debt, and he did leave Bear shareholders with some value - both less than ideal. But against that, he got the deal done and dusted over a weekend. And Hank learns from experience. When it came to rescuing mega mortgage operators Fannie and Freddie, he effectively took them into public ownership, and this time, he insisted the shareholders should get zilch (yes, all right, it's not full nationalisation, and the shares still trade - but at virtually zero value). Now with Lehman, he's played real hardball with the shareholders, who will get nothing whatsoever. So thank Hank. Taxpayers everywhere should be grateful that he has had the courage to spell out to bank shareholders not to expect bail-outs from public funds. As we've blogged many times, bank shareholders have enjoyed the extraordinarily good times (see US profitability chart above), so it's absolutely right and necessary that they accept the bad. And if they don't like the risks, they should force their bank managements to rein them in. "By deciding essentially to wipe out shareholders in Fannie Mae and Freddie Mac and acting even more harshly to the shareholders of Lehman Brothers this weekend, Mr Paulson has sent the clearest possible message to investors around the world: do not buy shares in any bank or insurance company that could, under any conceivable circumstances, run short of capital and need to ask for government help; if this happens, the shareholders will be obliterated and will not be allowed to participate in any potential gains should the bank later recover. This punitive policy towards the shareholders in Fannie, Freddie and Lehman, who had put more than $20billion of capital into these companies in the hope of keeping them alive, means that no US bank or insurance company can hope to raise any extra capital in the foreseeable future." Tyler has today had two ex-City colleagues independently speak to him about this article. WTF is Kaletsky going on about? Doesn't he understand how investment works? Doesn't he understand that equity investment is inherently risky but that there's a price for everything? Does he want a financial sector that operates on the basis that troubled institutions can always get extra capital from the taxpayer? How much money would taxpayers have to stump up, and why wouldn't Tyler (Cayman) Inc buy a dodgy bank on the cheap, crank up the risks, and then tap the government for funds? One colleague suggested Kaletsky is an unreconstructed Keynesian, who has never believed markets are better than government. The other suggested something we can't possibly repeat, but is a sort of rhyming slang. Let's keep all our extremities crossed that Alistair takes his lessons from Hank. Better still, why don't we have Chancellors who've actually worked in the financial markets? PS Who's really responsible for this crisis? The BBC and the left says it's greedy bankers, and they are certainly in the frame. But we need greedy bankers to drive risk taking - without them, economic dynamism would soon revert to lethargic corporatism. Trust me. The alternative view is that it's down to the Fed - 15 years plus of cheap money has inflated a giant wobbling jelly of debt which has finally come home to roost - just like those roosting jellies always do. If only they'd been tougher earlier, the greedy bankers would have been kept in check. We'll look out some data. Last night's C4 News was an absolute classic. According to Bishop Snow, the collapse of Lehman "guts the bedrock of global capitalism". "Nightmare... death... giant earthquake... tsunami... downward spiral..." - it was straight back to Private Eye's huge snakes roaming the streets of Britain's cities. 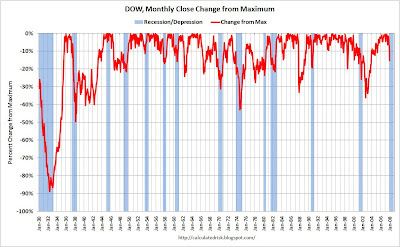 But one oft-repeated phrase really caught our attention - "The Day The Markets Went Into Meltdown". And how about "there has never been a day like this"? Never? As it happens, Tyler was at the screenface on Black Monday, 19 October 1987, and if he recalls correctly, Wall Street fell by 22.6% (DJI). Yesterday's fall? Just 4.4%. And according to Afraid to Trade (via FT Alphaville), yesterday's 4.7% S&P decline was only the 14th worse since 1950. Look, clearly this is a serious situation, especially if you work in one of the affected firms or own shares in them. But it isn't a market meltdown, and it isn't gutting the bedrock of global capitalism. Much more scary is the risk of gutting the bedrock of fiscal discipline. We've already watched as our bungling rulers failed to deal with the Crock, letting the Lloyds offer get away, leaving the incumbent management in place with a taxpayer guarantee, and eventually being forced to nationalise it in exchange for £100bn of dubious assets. How much worse will it be if they have to deal with, say, a failing HBOS? Its liabilities sum to over £600bn. As we've said many times, taxpayers should stand firm against bail-outs for bankers. We must not let wild exaggeration by the Bishop and others make us lose track of that simple point. You've got to welcome tax cuts. Even if the Major says they're only doing it in a last desperate bid to win back Guildford. And even if it's painfully obvious that most Lib Dem members fundamentally disagree with the whole idea. This is an Act of Decisive Leadership. Mr Clegg has stepped up to the plate. So which hospitals will he close? Which schools? Which planet saving green projects will he stop? Which groups of deserving poor will he cast out into the snows? It's all Good News. He's not going to do any of those things! Because he's had this brilliant insight - and you'd better sit down - the government wastes billions of pounds every single year! So all you've got to do is cut the waste, and hey presto, you've got £20bn to hand out in tax cuts. The only pity is that someone hasn't thought of this before. No, of course, here on planet Earth the LDs will never have to implement any of this, so in that sense it doesn't matter. 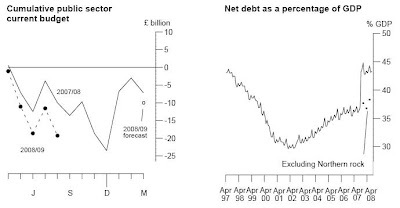 But credit where credit's due - this is an important moment in terms of the tax and spend landscape. It's a public confession from the Big Government LDs that tax cuts must have primacy over more spending. And while their waste reduction plan is no more realistic than Gordo's ridiculous Gershon programme (see previous blogs), upfront tax cuts are a well established route to slimmer government. Back in the 80s it was known as "starving the beast". But much better than a few disembodied tax cuts would be the establishment of that third fiscal rule - the one that directly limits the growth of public expenditure (beloved of BOM and blogged ad nauseam, eg here). To listen to the TV and radio reports overnight, you'd think the end of the world had finally pitched up. Hmm. Before selling up and climbing aboard the ark, let's just take a moment to reflect on motivation. We all enjoy a good disaster story, sure. But this story is being fueled by a couple of other key factors. For one thing, the lib media loves the idea of Biblical damnation for those evil overpaid bankers. They are positively slavering for the Day of Judgement, in which the righteous will be vindicated, and the enemies of the Lord will be vanquished in a blizzard of new rules and regulation (not least over their PA moolah). No wonder they're talking it up. Second, the bankers want immediate further cuts in interest rates and more taxpayer bail-outs. No wonder they're talking it up. Except of course, they don't want to frighten us punters into another bank run, so they talk up the problem in private, to central bankers, politicos, and excitable journos. Clearly, when a bank like Lehman goes bust, the pain is real enough. Shareholders and employees take a real hit. But that happens when any company goes down, and these days we don't bail them out. Of course, as we keep being told, banks are different. They are central to the operation of our economy, they are interconnected in mysterious and potentially dangerous ways, and they hold vast amounts of our savings. So when they hit the wall, taxpayers have to step in or risk eternal damnation. I am optimistic that investment banks will turn out to be more like normal businesses than like the negative-externalities-on-steroids painted by the Fed and the Treasury during the Bear Stearns rescue." In truth, we don't really know how this will pan out. But what the Prof is telling us is that taxpayers should not allow themselves to get panicked at the first smell of sulphur. Yes, it's dramatic, but Lehman's demise is hardly unexpected, and our hunch is that we'll somehow muddle through. As the Today's City interviewees said this morning (much to Humphrys' disappointment), the most likely outcome is that credit will become a bit scarcer, the economy will slow even more, and longer term there will be more bank regulation (maybe a formal split between retail and investment banking). But the end of the world it ain't. PS More to the point, WTF has happened to the Brown/Darling "plan" for an enhanced depositor protection and a special resolution regime for busted banks? We blogged its first appearance nearly 9 months ago, and although there've been various mumblings since then, so far as we know, it still isn't enacted. A sense of urgency, it ain't. Wind tubines are an expensive toy. Not only are they eating money and despoiling our countryside, they simply cannot provide the dependable power we must have. The politicos who have signed us up for this outrage should be strapped to turbine blades as a warning to others. As BOM readers will know, British taxpayers are fleeced for hundreds of millions to fund aid to India (c £2bn over 8 years - the UK's biggest aid recipient). Yet super-tiger India is no longer poor poor, and pumps huge amounts of its own cash into defence. At least we're not currently giving aid to China. The top man blames their collapse on the surge in oil prices and the credit crunch. "Money ran out as suppliers began to demand immediate cash payment for services. The banks refused to supply more credit." They've collapsed you see. A busted airline just goes bust. The top man, the Board, the employees... everyone loses their jobs. The assets are flogged off to people who can make better use of them. 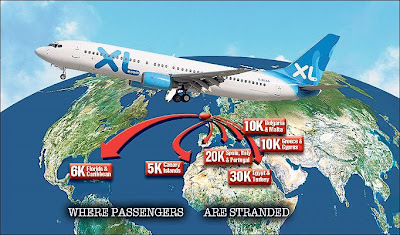 The world says goodbye to XL Airways, and the banks kiss goodbye to another shedload of cash. That's how the real world works. Ah, but government, that's different. Yes, they've racked up the same horrific debts, and yes, they blame their current crisis on the same oil price hike and credit crunch. But no, they will not be going. And their bankers cannot refuse to supply more credit. Because their bankers are us, and apparently we have to stump up no matter how much gets pissed away. So instead of going into immediate administration, the current "idea" seems to be that Labour needs a "convincing new narrative". Never mind that their pants are now a roaring inferno, and if they could still walk that way they certainly wouldn't need the fire extinguisher. According to ex-Commissar Hewitt and 11 other luminaries, if they can just cook up that "convincing new narrative", they'll be back on track. "We need to explain what we’re going to do about the things that affect people day to day: inflation and interest rates, household bills and mortgages." Get the vacuous let's-assume-away-the-problem kind of idea? We watched Newsnight's "political panel" discussing this last night. It was on just before the Newsnight Review of the week in the arts. Which was no coincidence - vast amounts of the political debate among Westminster insiders seems to comprise nothing more than a search for a narrative. It's politics reduced to a play or a Booker entry. No successful business could run like that. Businesses have to provide goods and services that customers are actually prepared to pay for. Yet we somehow allow the arrogant clowns who spin and narrative their way into government, to spend 43% of our money without neccessarily delivering anything we actually want. As we listened to that studiedly scruffy Labour insider bloke who's married to the bird on the sofa, Mrs T put it in a nutshell: we don't want a convincing new narrative - we just want you all to eff off. PS Yes, and another thing... why has the BBC got a specialist correspondent covering all the various ways government spends our money (Education correspondent, Health correspondent, Environment correspondent, etc etc), but no specialist correspondent covering the ways the government takes our money? Why haven't they got a Tax and Charges correspondent? Gah.